Making Turns in Colorado’s Front Range, Volume 2: North of Interstate 70. Image courtesy of Fritz Sperry at Giterdun Publishing. Where can I get it? First, check your local shop. 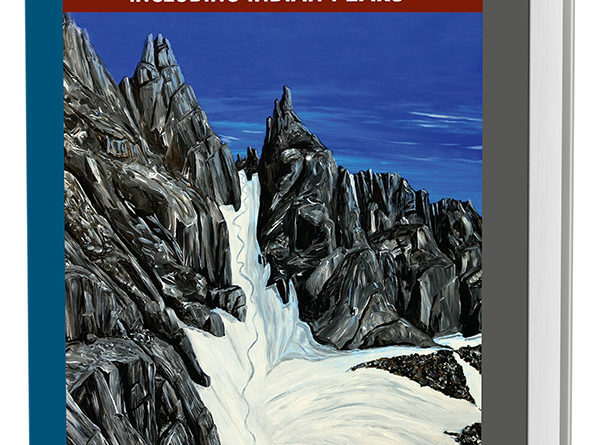 Many local mountaineering shops on the Front Range including Bent Gate in Golden and Neptune Mountaineering in Boulder will be carrying this book. If your local shop isn’t carrying this, then request it. The book can also be purchased on the publisher’s website at Giterdun Publishing. Making Turns in Colorado’s Front Range, Volume 2: North of Interstate 70 is another great book written and published by Fritz Sperry. A continuation of Volume 1: South of Interstate 70 This book features 109 routes spread among 55 peaks or regions that are great for backcountry skiing or ski mountaineering. Some of these areas feature one or two routes, while others have more – 9 is the largest routes I counted in a specific zone. As the book title states, all of these routes are on the Front Range, and north of Interstate-70, reaching as far as the upper reaches of the Indian Peaks. This guidebook is fairly well organized and easy to follow. First, Sperry includes a page with a map of the area that is north of I-70, with route numbers placed near the approximate route location so that you can easily see where each route is relative to the others. This map is followed by the table of contents which is broken down into sections which match the sections of the book. At the end of the table of contents is another table which breaks down the routes by general difficulty based on the season – winter or spring/summer. From there, the book is divided into sections. 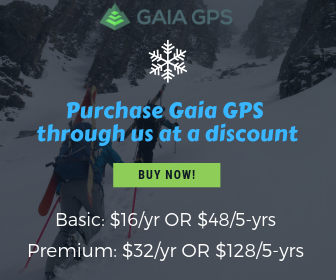 The first section features the Introduction which summarizes how many of the fundamentals of winter and spring backcountry travel like avalanches, weather, cornices and backcountry etiquette. Sperry also includes pertinent information about wildlife, marijuana use on public lands, and communication. Last, Sperry explains how best to use his guidebook. Each section of the book is clearly marked in the upper corners of the page, so readers know which section they are in, making it easier to navigate your way quickly around the text. For example, the Introduction is marked with a gray “i” and the trailheads section is marked with a brown “th”. After the Introduction follows the Trailhead section. This section lists all the trailheads in order of how they appear in the book and describes how to get to them. Photos are included with the trailheads so travelers can be reassured that they’ve shown up to the right place. Next, is the meat of the book – the ski routes. Sperry lists 55 peaks or zones, mainly organized geographically from south to north. Most areas have over one route listed, adding up to well over 100 routes total. In the fashion of his Vol. 1 book Sperry organized routes by number and letter so that lines that share the same peak or zone share a number, but are assigned a different letter. Routes that are on different peaks or are in different areas have different numbers. Also similar to that of his Making Turns in Colorado’s Front Range: Vol 1 – South of I-70, Sperry continued to organize his route descriptions with a table that states the route number, peak or area, name of the route, difficulty, distance, vertical gain/loss, sunhit, aspect, preferred season, trailhead name, and page numbers for maps and for photos. The route numbering system corresponds with the numbering system on the maps as well. 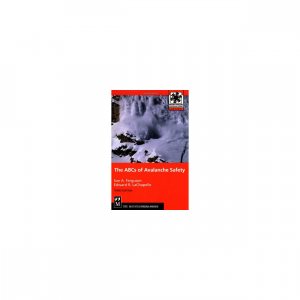 The actual descriptions themselves are quite detailed giving necessary route-finding information as well as stating any concerns that may be present for each specific route, such as rockfall or potential avalanche danger. 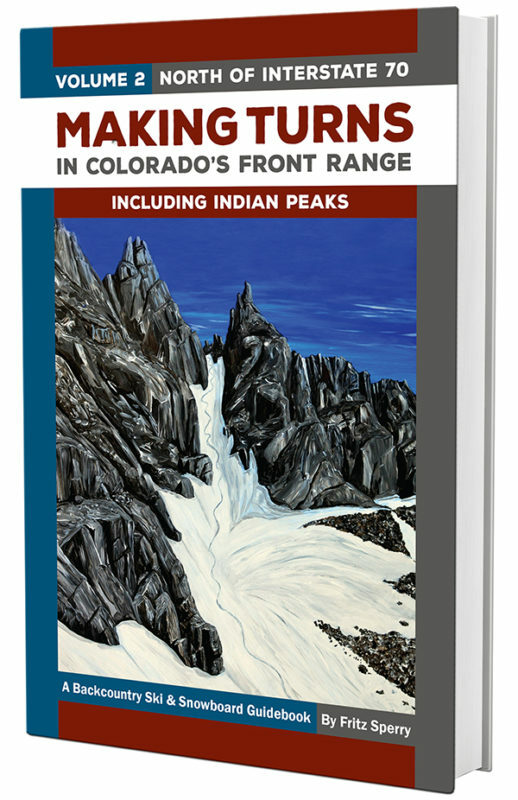 As is typical for all of Sperry’s guidebooks, Making Turns in Colorado’s Front Range, Vol 2: North of I-70 is printed in color and full of vibrant photos which both help to add to the route description as well as to the stoke of the book. Readers will find maps located at the end of the book. Routes are marked by their corresponding number and letter, and color is used to help make the map more clear. Many routes are included in one map which allows users to see how the geography of the region all fits together. I think this is one of the best attributes of Sperry’s books in general – instead of having a map for each route, one map is used for several. Another great feature of this series is Sperry’s use of “sunhit”. For example, in the table at the beginning of a route he might say, “Sunhit: Sunrise +1 hour”. Toward the end of the book, Sperry has a “Sunrise/Sunset Chart” which lists the sunrise and sunset for Colorado for every day of the year. Sunhit can really be a useful thing to know, especially when timing for spring lines and trying to avoid potential wet slides. Aside from routes, Sperry also includes a section about traverses, which could be done in a day by the hardy and as overnights by those wanting a slower tour. These traverses usually include areas already mentioned in the text. Last, no Sperry book would be complete without his famous “Teasers” section. I’d say he has more teasers than usual, totaling 25 in all. There’s just a lot of cool things to ski in these parts! I’ve mentioned this before in my other reviews of Sperry’s books and I still feel the same – the trailheads can be a bit confusing and this continues to be an issue in Making Turns in Colorado’s Front Range, Vol 2 – North of Interstate 70. Sperry lists the trailheads in the route description, but then readers must flip through the trialhead section until they find it, or refer to the table of contents at the front of the book to find the page number where the trailhead description is located. I believe that organizing the trailheads in alphabetical order, rather than the order that they appear in the book, might make it more user friendly. Alternatively, Sperry could include the page number of the trialhead in the route description, just as he does with the maps and photos. This confusion transfers over to the maps where trailheads are marked with a “P”, but no name or number associated with them. One must look at the route number in order to take a guess at which trailhead is being shown on the map. Adding some sort of naming of trialheads on the map might help to make navigation easier. Fritz Sperry publishes under his own company, Giterdun Publishing. This is Sperry’s third book to write and fourth one to publish. Sperry’s first book was Making Turns in the Tenmile Mosquito Range published in 2012 and his second was the first of this series – Making Turns in Colorado’s Front Range, Volume 1: South of Interstate 70. In 2013, Giterdun also published Backcountry Skiing and Ski Mountaineering in Rocky Mountain National Park by Mark Kelly. While all of these books are valuable resources to Front Range backcountry skiers, each guidebook Sperry publishes continues to be an improvement over the last. Vol. 2 – North of I-70, is better organized and more succinct, yet still full of valuable information. We look forward to more publications from Giterdun and more guidebooks from Fritz Sperry. I always look forward to another Fritz Sperry book! Why? Because there’s always something in them I’ve never heard of skiing. Sure, Sperry includes classic and popular routes in his books, but he also includes lesser traveled zones as well. 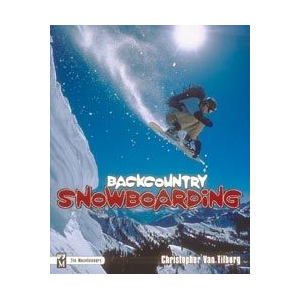 Of course, in publishing his very own guidebooks you could argue he is shaping the future of backcountry skiing, and perhaps some of these lesser known routes will become classics of their own. Either way, you’d be hard-pressed to find a more thorough guidebook that Sperry’s, either in-print or out of print, for nearly any zone he publishes about. 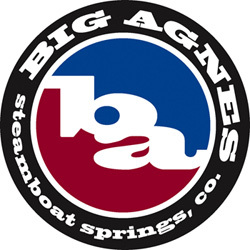 As a whole, Sperry has put together yet another highly valuable resource for Front Range backcountry ski and snowboarding routes that are north of Interstate-70. Sperry’s guidebook is full of detailed information that will get you to the trailhead and up and down the mountain safely. Any Front Range skier will find Making Turns in Colorado’s Front Range, Vol 2 – North of Interstate 70 a great addition to their library. I know that we are happy to have this one standing beside our stacks of other cherished guidebooks! 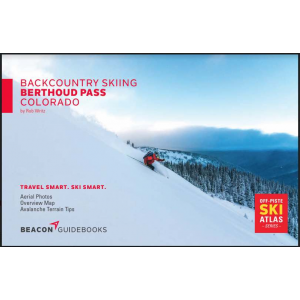 Sperry captivates backcountry skiers & ski mountaineers in Making Turns in Colorado's Front Range, Vol 2 with 109 detailed routes all north of I-70. ← Crested Butte Ski Season 2016-17. So Far.